Richy: Now that we all have a copy of Volo’s Guide to Monsters in our mitts, what do you guys think? I personally love the supplementary dives into the D&D universe. The material is always inspirational, especially as a DM. I only have the standard edition though… not as cool as you guys. Jason: The game store exclusive cover is pretty great, but it doesn’t match the other books, so there’s a bit of a downside. Dungeons and Dragons 5th edition is my first edition of D&D so with every book that Wizards of the Coast releases almost all of the content is totally new to me. Even up until release I didn’t really know what to expect from the book or who Volo even was. After getting the book, Volo is mostly an afterthought aside from an introduction and some sidebars here and there. The rest of the book is presented similarly to the content in the other books so far. Bill: 5th edition is not my first experience with D&D, but it is my most recent. I played a lot of 2nd edition AD&D and had acquired many Forgotten Realms expansions and source books over the years. Volo’s name is something I instantly recognized from these older books as the narrator, of sorts, for a few books that I owned. I was pretty excited to see this announced. Richy: Two very contrasting perspectives for sure! So all in all, does this seem like a solid add to the D&D universe? From the standpoint of a veteran player and a new player entering this game-verse, curious if this feels more like a way to make money off of the franchise or if it is really expansive and value added. Bill: This book felt like a compilation of things I remember from the Forgotten Realms books over the years. There was a long break in roleplaying for me that lasted 15 years and 3 versions of D&D. Knowing that, I’d say this is a solid source book for D&D 5e. What I would say though is that this book reads like a great guide for a DM looking for ideas more so than a source book for player characters. This doesn’t make it bad for either group though, just maybe lopsided slightly. I will also say that my current opinion on Wizards is they’re focused more on miniatures than they are source books for their leading RPG. Richy: OK, so Monster Lore. First Section of the guide. It’s a deeper dive into some of the more iconic beasties and villains and more specifically how to role play them as a DM. I mean Beholders typically like to have pets, I now feel like I can relate to them a lot more than I used to. Anything that stands out to you guys? Jason: I love looking through these books and having my head filled with little ideas for interesting situations. As a player and an occasional DM I don’t have much interest in the Forgotten Realms and prefer to play in a homebrewed setting, so a lot of the very specific lore is stuff that I just skim over. But there is also a lot of information that serves to generate a lot of fun ideas. There are also a LOT of random tables! Roll for beholder eye color! I also really like that they included some maps for each of the lore races. Though I haven’t DM’d a lot, I think I prefer a more improvisational style, and having maps like Volo’s Guide provides are a great tool to pull out when needed. Richy: Oh, the tables are fabulous. So let’s roll up a quick beholder! Eddalx was always a bit larger than the other Beholders. His smooth pink skin and long thin eyestalks were a mismatch to his physical stature and gaping maw cascading with spindly fangs. His soft violet eye didn’t help how the other Beholders perceived him either. He never trusted his peers, always paranoid that they would betray him. His way became that of the abused, a misguided sense of justice and righteousness coupled with a superiority complex unmatched by the most sinister devil in any of the Nine Hells. Eddalx maintains control in his domain through the employ of ignorantly loyal Orcs and Trolls. He finds comfort when he allows himself reprieve from his toils amongst his pure bred Chimeras. This is already proving to be an amazing supplement to tie in with the Dungeon Master’s guide! I’m feeling giddy! Jason: I think my favorite race from the Lore section is the Hags. Something about these twisted covens of evil monster women just hit all the right fantasy tropes for me. Volo’s Guide expands on the hags pretty significantly from what is in the Monster Manual. Everything about the Hags is designed to be twisted, weird, and make the players nervous and uncomfortable. They have lair actions, change the environment around them, and try to manipulate characters into corrupting themselves. Awesome. Bill: I was pretty impressed with the background for the Gnoll. I’m sure this has existed previously in D&D but really, Gnolls were just something you killed in small parties like Goblins or Bandits. I enjoyed reading about their background and the fact that they have an open thirst for slaughter commanded by a demon lord named Yeenoghu. Putting the incentive behind a ‘generic’ monster is a cool story telling mechanism and something that this book seems to offer in spades. Richy: The character races expansions are my favorite supplements by far. The Player’s Companion 5e supplement as great, but this is even better. I want to be a Kenku! Did either of you have one you will definitely consider for one of our future games? Jason: Kenku definitely seems interesting, they were a monster that always stood out to me in the Monster Manual. I think the best part about the Kenku entry is the note that playing as a Kenku and imitating noises all the time can be annoying to other players. It seems like a fun race to play. The Tabaxi was another one that stood out to me, which was unexpected. It might have quite a bit to do with the art that accompanied the entry. That just looks like a cool cat dude. I think the real standouts for me were the “Monstrous” characters; Goblins, kobolds, and orcs? Yes please. A party that was a group of goblins seems like it would be very fun. Bill: I’m glad this book adds in more playable character races, even some non-standard types. I would for sure consider playing a Lizardfolk, but have a hard time not referring to them as a Lizardman. I like how the book describes their overall attitude and demeanor and it seems like it’d be interesting to play a character like this. Richy: Finally, supplemental bestiary. Favorite add, least favorite add. Ready, set, go! 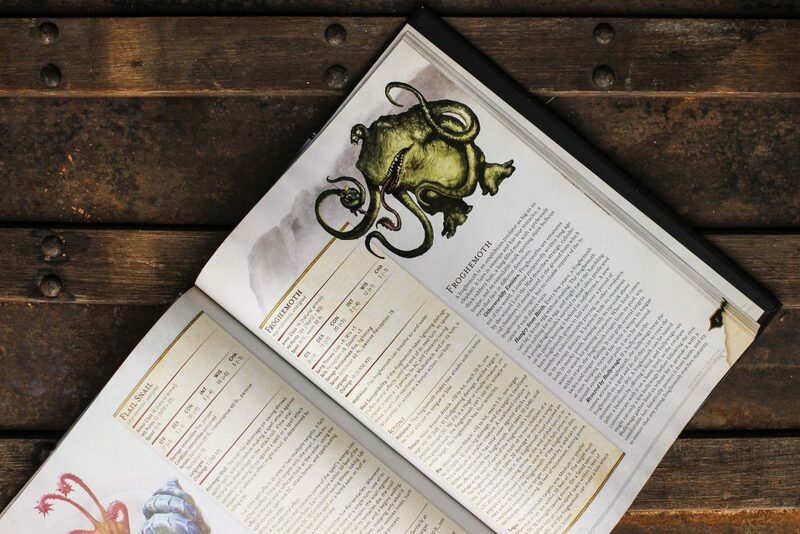 Bill: I’m glad to see the Quickling in the bestiary, they are a really neat type of character to include in campaigns, especially if the DM is looking to add some hard to describe mystery with an actual ‘being’ behind it. The little bit of backstory is sufficiently dark and depressing for their race and their role in a game could be very interesting. It also reminded me of ‘Brownies’ a playable character similar to this that was use in my game groups as a joke character or NPC. I think the least interesting thing is the addition of dinosaurs, maybe it’s because I’ve never played a caveman in a D&D campaign, but I just don’t see the appeal in a fantasy setting. Jason: One thing I really like with the bestiary is that they added several new low challenge rating monsters. All of the big CR10+ monsters are great to look at in a book, but it seems like as players, you don’t see them very often. Everything that got me excited were less challenging creatures. Boggles were the first thing that caught my eye. They look creepy and can excrete a sticky or slippery oil, as well as make small magical opening that they can travel through. They seem like fun little monsters to encounter. The other that I thought was really neat was the Grungs. These are little frog-like creatures that are brightly colored according to the social caste that they fall into. These guys excrete different poisons that compel those affected to different things. Apparently I have a thing for creatures that excrete things? Richy: Grungs were on my list as well! I also like the Redcap. Why? Because combat encounters shouldn’t always be obvious. The party is wandering and suddenly they come across what to their eyes looks like a solo Gnome in the woods. Then suddenly surprise! Murder rage fueled solo berserker assault by a two foot tall bearded fey! As far as a least favorite add is concerned, I have to agree with Bill. I’ve always thought the option for dinosaur stats was cool, but beyond what is supplied in the Monster Manual, I generally struggle to find the use or need for the existing dinosaurs. Especially because they aren’t nearly as interesting as most of the supplied mythical fantasy beasties. Overall we’d say this book is a good purchase. While the Sword Coast Adventurer’s Guide offered lots of Forgotten Realms information, aside from some new player races and classes, it didn’t feel like it offered much else. 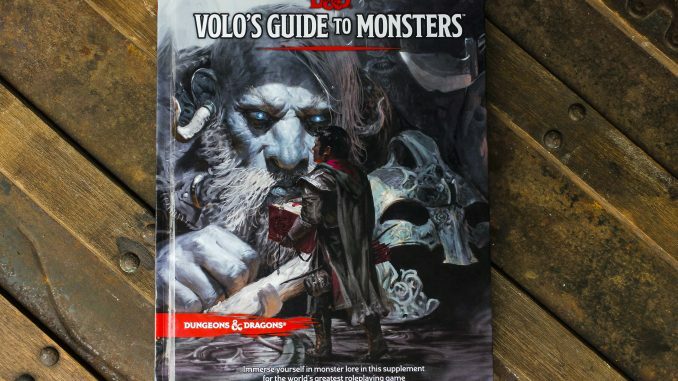 Volo’s Guide to Monsters is a book that will allow anyone playing in any setting to expand on their world with interesting new options.